This evening my oldest son had dinner with us. I made Chicken Parmesan for dinner and served it over yellow summer squash "pasta" that I prepared with my little julienne peeler. I used chicken breast cutlets to make the Chicken Parmesan (instead of chicken breasts) since I had a couple of packages in the fridge. I decided to try a slightly different way to prep the "pasta" this time. Normally, I julienne the squash or zucchini and very quickly saute it for 2 to 3 minutes over medium-high heat right after preparing it. As many of you know, oftentimes squash or zucchini "noodles" release juices on your plate after putting sauce over them. Since I already knew I'd be making this for dinner tonight, I went ahead and julienned the squash last night and placed it in a paper towel lined bowl and folded the paper towels over the top and placed a small bowl on top to add a little weight. I placed the paper towel wrapped "pasta" in the fridge overnight and then sauteed it this evening...so basically it sat for 24 hours wrapped in paper towels. The paper towels wicked quite a bit of moisture from the strands of squash leaving them more dry than I had ever had them before. This evening there was almost no liquid on my plate after topping it with the Chicken Parmesan and sauce. It turned out great. Since I've only tried that little experiment once, I don't know if maybe I just lucked out with a less juicy/watery batch of squash or if wrapping it in paper towels for 24 hours made the difference (I think it actually did help wick a lot of moisture from the squash based on how wet the towels were)...but I plan to test it again next time I make "pasta" to see for sure. I snapped a quick photo of our dinner. 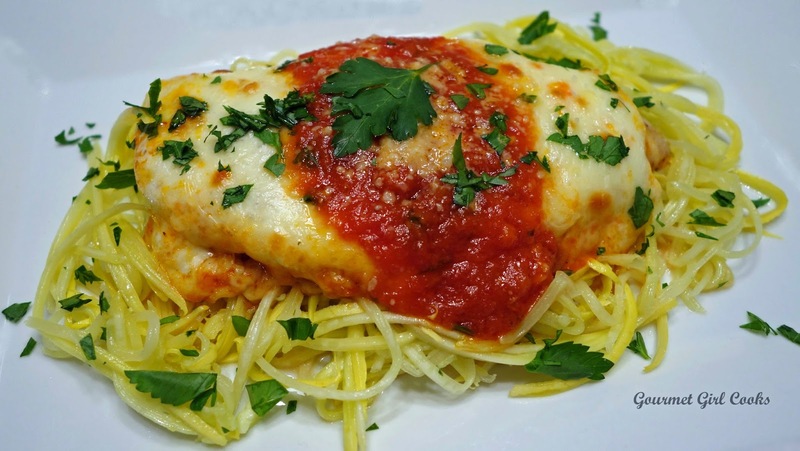 The recipe can be found here: Chicken Parmesan. Enjoy! Am so glag I found your blog....made caprese cutlets and mashed califlower(your way) and my husband and 17 year old son loved it!!! Success! If you have less time, you could try "purging" which is heavily salting the squash, letting it sit for about half an hour to an hour and then rinsing it. The salt pulls a lot of moisture out, but it does leave some saltiness in even after rinsing (not much, but about like salting the water when you boil noodles), so cut down on any salt you might otherwise add. This came out wonderful!!! Whole family loves, even picky son. Salting zucchini made the pasta turn out really nice and not watery. The chicken is also great! This meal will definitely be in our rotation. Thanks!! !